Ice caps are the coldest places on Earth; average monthly temperatures never rise above freezing. Ice caps occur in the bitterly cold Arctic and Antarctic over the interior of Greenland and continent of Antarctica. Despite their frozen, harsh climate, ice caps and their surrounding waters are home to several hearty, adaptable animal species. Polar bears, ursus maritimus, roam the arctic ice caps and ice sheets in search of their favorite prey, seals. Their large, slightly webbed front paws and dense, thick fur make them adept hunters on frozen land and in the frigid sea. As strong swimmers, they’re able to cover hundreds of miles and stalk thin ice where seals congregate to breathe. 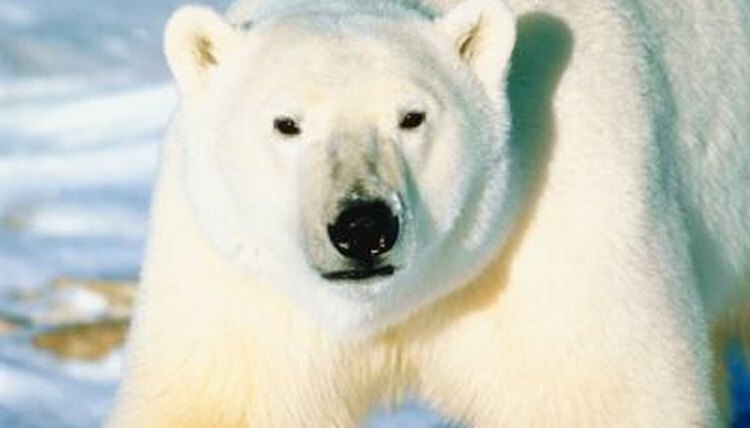 The 900- to 1,600-pound polar bear has bright white fur that provides camouflage in the ice and snow and no natural predators, making her the queen of the Arctic. Seals, the mighty polar bear’s favorite prey, inhabit ice caps and the surrounding waters. They spend time the majority of their time beneath the ice caps hunting arctic cod, crustaceans and mollusks. One species of seal, the Weddell seal (leptonychotes weddellii), prefers not to migrate, instead living near ice caps year-round. These 1,000-pound beauties are slow on land but can swim at a speed of 5 to 7 knots, dive almost 2,000 feet deep and remain underwater for up to an hour before surfacing to breathe. When they do need air, Weddell seals use their sharp canine teeth to create breathing holes in areas of thin ice. Several species of birds live on ice caps, at least during the warmer summer months. These include ptarmigans, snowy owls and ravens. Perhaps the most remarkably adaptable species, the raven (corvus corax), scavenges the ice caps in search of delicacies -- just about anything it can fit in its mouth. Ravens consume other birds, rodents, grains, worms, insects and even human garbage. Near the ice caps their likely diet consists of small insects and carcasses left behind by polar bears. Orcas and beluga whales are indigenous to ice caps around the Arctic Circle. Belugas (delphinapterus leucas) inhabit the shallow waters of Arctic seas surrounding the ice caps. These milky white whales are social animals preferring to live in pods of hundreds and even thousands. They rarely breach the water’s surface, instead spending their time vocalizing, swimming and playing with plants, dead fish and even air bubbles underwater. Their diet is varied and includes smelt, flatfish, flounder, sculpins, salmon, cod, crab, shrimp, clams, worms, octopus and squid. A beluga lacks an abundance of sharp teeth so he uses suction to grab and trap prey and then swallows it whole.